Boston, 1978. Two gangs meet in a warehouse to close a weapon deal. But then things run out of hand.. Free Fire is directed by Ben Wheatley and was released on Apr 21st, 2017. 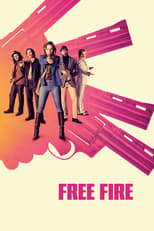 Director Ben Wheatley's Action & Crime movie Free Fire is produced by Rook Films & Protagonist Pictures & was released 2017-03-31.